Are you all idiots? That was obviously photoshoped. So big.And i can’t hold it. Soooo……….. where do you hold it? these comments r so adorable. It is wireless, however it must be connected to an external battery pack (only 77lbs) at all times. how should I touch this …… thing. Its not microsoft, its sony. The XBOX one is much much much better. Your a fool xbox one was built not with gaming being the main focus nobody wants to use their system to watch tv. Not to mention that microsoft had to change their whole gameplan after realizing that not being able to play without an internet connection and not being able to play used games. Sony is and always wil be the face you see when you mention gaming. errr, i think this is fake. Do you really think that this is a real thing! 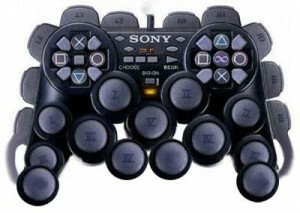 omg thts not best controler its to complicated !!!! WOW!!! WHAT THE HECK MICROSOFT, NOT THE CONTROLLER I WAS LOOKING FOR!!!!! You do realize that PS4 is Sony, right? You realize its not real!